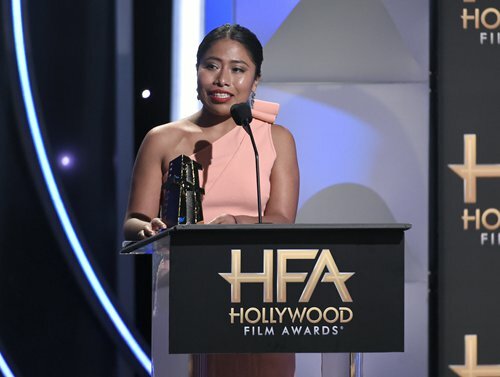 Yalitza Aparicio had just gone along with her sister to the casting call for Alfonso Cuaron's new film. She had no intention of trying out herself. But destiny put her in front of the camera and that was how the Mexican woman of indigenous origins, who had just graduated as a teacher but wasn't yet working, became the star of Roma. She is likely now to spend the next few months learning how to handle Tinseltown red-carpet ceremonies - Cuaron's latest film is a sensation, and her work is generating major buzz. Roma won the Golden Lion at the Venice Film Festival, has been nominated for three Golden Globes and is a strong favorite for the Oscars in February 2019. "It wasn't something that I really wanted or had dreamed about," Aparicio, who turned 26 on Tuesday, told AFP. "Because of your socioeconomic status or your culture, you think you can't aspire to be an actress, and to participate in this medium that sounds like a fantasy." After his Oscar-winning Gravity, which took home seven trophies, Cuaron bet on a very personal project. Roma tells the story - in black and white - of the two women who made a deep mark on his childhood in Mexico City. Cleo, played by Aparicio, is a domestic worker who becomes pregnant after her first sexual encounter. The director's mother and lady of the house, played by Marina de Tavira, is about to be left by her husband for another woman. Framing all of it is the turbulent Mexico of the early 1970s. Aparicio had no Cleo in her childhood in Tlaxiaco, a town of 40,000 people in the southwestern state of Oaxaca. But her own mother, who raised her on her own, worked as a maid and that helped Aparicio understand the relationship of love and heartbreak that can form between caregivers and their bosses. "There were scenes during the filming that stirred my memories, and there arose, all by itself, my character's need to protect the children from what was happening so they would not suffer," she said. Cuaron, who also directed Harry Potter and the Prisoner of Azkaban, said the actors in Roma were "the best" he has ever worked with. The film, which had a cinematic release in select US theaters, will be available on Netflix on Friday. The first requirement for becoming a member of the cast of Roma was to physically resemble the real people in the director's life. "The directive was that they had to physically look as much like the original people as possible," Cuaron told AFP. "And on top of that, they should have the same energy." Aparicio's sister ended up not being cast because of her advanced pregnancy. But since the young teacher was there, she did the first of many screen tests that led ultimately to her winning the part inspired by Libo, the director's nanny, who Cuaron says "cries every time" she sees the movie. Before filming began, Aparicio met with the now elderly ex-domestic worker. "She told me only how she came to the house, about her relationship with the family, but it was left at that," she said. Cuaron did not give out the entire script at once, only parts of it. Filming unfolded in a replica of the house where he had lived as a child in the upper middle class Mexico City neighborhood of Roma - hence the film's title. The set was so close to the real thing that his mother, who died recently, and the rest of the family were impressed. Despite having no previous experience, Aparicio has been applauded by other actors, like Tom Hanks, and by critics. The New York Times included her in a list of best performances of 2018. "After living through this whole adventure, I realized that the movies aren't as far away as I thought from what I had always dreamed of doing," she said. "Through films, you can educate people in a more massive way. But let's see if some offers come my way," she added, discussing her future with humility. For now, Aparicio plans to experience the moment, which has included not just accolades but also ugly racist and class-related insults from some of her compatriots after she appeared in designer clothes in Vanity Fair magazine. She ignores the abuse, though, and focuses on what's important to her: change. "I am showing my people that they also can reach something like this, that just because you don't have blonde hair and green eyes, it doesn't mean you can't be a part of it," she said. "There are certain things that will change little by little in our culture and let's hope that with this picture, something is learned."